Insect eating birds, Hamsters, Rats, Mice, Tropical fish, Sugar Gliders and All Leopard Geckos, Bearded Dragons, Aquatic Turtles, Box Turtles, Blue-Tongued Skinks, Uromastyx, Forest Tortoises and more. Mix in with your pets daily diet or feed separately. Remove and dispose of any uneaten food after 24 hours. Always have drinking water available for your herps. No vitamins or calcium have been added to this product. 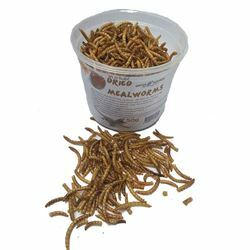 Insectivore Treat can also be used as a weekend feeder, travel food or just to have on hand when live insects aren’t available. They can be used to soak up medication for easy administration. Mealworms: a source of collagen protein an important fiber that aids in building bone, cartilage, skin and claw structures.